Kolkata: A 68-year-old renowned psychiatrist, Dr Mrinal Kanti Debnath who has a distinguished professional career in various countries, would cast his vote for the first time in India in the upcoming Lok Sabha elections. The doctor has never visited a polling booth after being forcibly stopped from exercising his franchise as a first-time voter over 50 years back. Despite having spent over 27 years overseas as a psychiatrist, Dr Debnath – the BJP candidate from West Bengal’s Barasat constituency – still can’t forget the disappointment of how “some political activists didn’t let me cast my vote”. Dr Debnath is a fellow of the Royal Society of Medicine, London, and a trained professional in Psychiatry (D. Psych.) from the University of Vienna. “As a new voter, I could not exercise my franchise in the late 60s during the United Front regime in the state as some miscreants had asked me and my father to go back home as they had already cast our vote,” the doctor told IANS. “This incident of scientific rigging had hurt me and I did not vote thereafter before leaving India in 1981,” said Debnath, who is up against a fellow doctor, sitting Trinamool MP Kakoli Ghosh Dastidar, and All India Forward Bloc’s Haripada Biswas. The Congress has nominated Subrata Dutta. Talking to IANS about the hardships he had faced in his past, he said, “Born in a remote village in Khulna district of then East Pakistan (now Bangladesh), Debnath, a meritorious student, went to Khulna town in January 1964, for pursuing higher studies as one could only study up to the 8th standard in schools in his native village.” Within a couple of days, he had to flee the town with “a bitter experience of communal violence” and migrated to India. “I came to India with only a half pant (shorts) and a shirt, and without a single rupee in my pocket. One of my friends, who too had fled the country after being attacked during the Khulna violence, and I had to sweep and clean buses for a livelihood,” he said. He was separated from his family. His relatives, in fact, collected the ashes of the deceased youth and started believing he was dead. Recalling his hardship, Debnath said he had managed to get admission to class 9 at a local institution with the help of a school teacher. He even borrowed books, but could not afford electricity. However, he emerged a topper in the school final examination and secured a National Merit Scholarship with Rs 110. 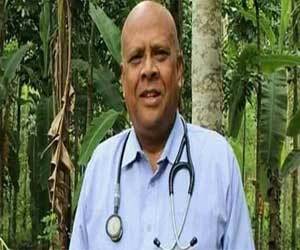 Dr Debnath had completed his course in medicine in Kolkata and practised for a while before moving to the Caribbean nation of Saint Vincent as the medical officer of a state-run hospital. He also served the Inter-American Drug Abuse Control Commission (CICAD) of the Organization of American States in the US before returning in India. Now, as a Lok Sabha poll candidate, he is “enjoying his new innings” at the age of 68. His overseas friends across Europe and America are helping him out through a massive social media campaign. “Reaching out to youths is important and the tool to reach out to them should be social media as voters in Barasat constituency are active on Facebook, Twitter and Whatsapp,” he said. He has also charted an elaborate plan to roll out an e-health programme for all the Assembly segments within the Lok Sabha constituency if he is elected. Dr Debnath, an Indian citizen by registration, slammed the ruling Trinamool Congress for opposing the implementation of the National Register of Citizens (NRC) in West Bengal. According to him, the NRC is a must for the country’s security and to identify the infiltrators.